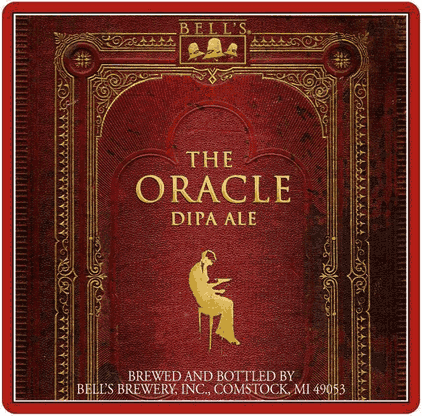 The Oracle is a summer seasonal from Bell’s Brewery out of Kalamazoo, Michigan. This west coast double IPA has a hearty 10% ABV. The Oracle pours a light amber with gold highlights. The head starts as a big two inches of foam, before fading to a half inch. A noticeable sheet of lacing hangs onto the side of the glass. As one would expect from a West Coast Double IPA, this beer smells like pine, grass, orange and grapefruit. I also picked up notes of cotton candy, which really got me interested. The first thing that struck me was that this was a syrupy thick beer! A bold, but not overpowering pineyness flows through the forefront, before the fruit backbone hits you. In this sweet wave at the end both grapefruit and (the surprising) pineapple. Very mild caramel malts appear in the backend, adding an extra dimension to an already flavorful beer. The hops and fruit balance together quite nicely once the beer warms, creating a rather enjoyable DIPA. An abrasive “scratchiness” assaults the mouth on the initial drink. This only lasts a second, but is enough to lower the score on this beer. Like a said before the mouthfeel is syrupy and sticky, which dries out your mouth in the process. Thankfully this beer settles down as it warms. The Oracle is a respectable DIPA. Not quite as balanced as some of the giants of the style, but a beer that has potential to be a contender (with a little bit more practice).